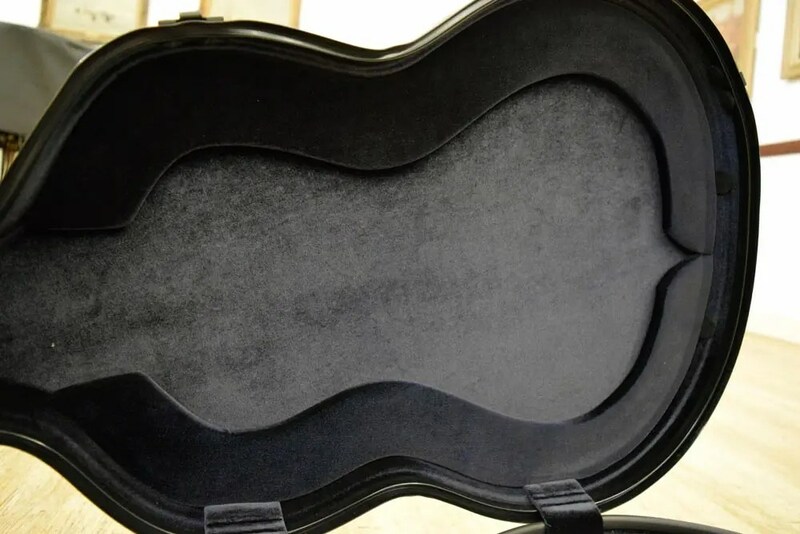 This is a review of the BAM guitar case for CGRocks. 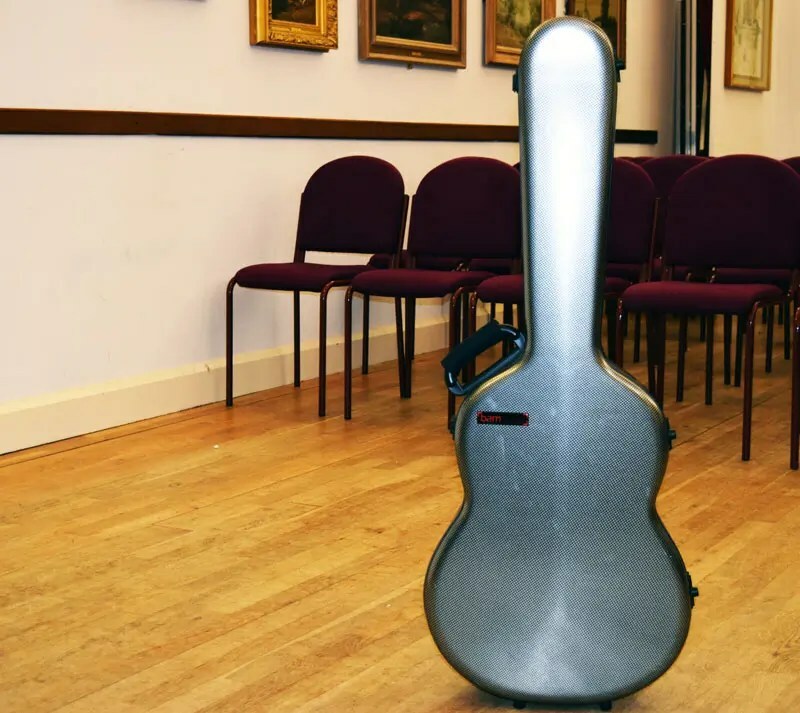 If you have been out and about lately in any sort of classical guitar concert or masterclass chances are you have seen the must have item for any aspiring guitarist, the chic BAM guitar case. With its clean lines and carbon fibre body it turns as many heads as a super model at the Paris fashion show. However how good are these cases? And are they worth the money? This is what this review aims to find out. Now straight off the bat these case are light, like super light, and comfortable to carry around town. 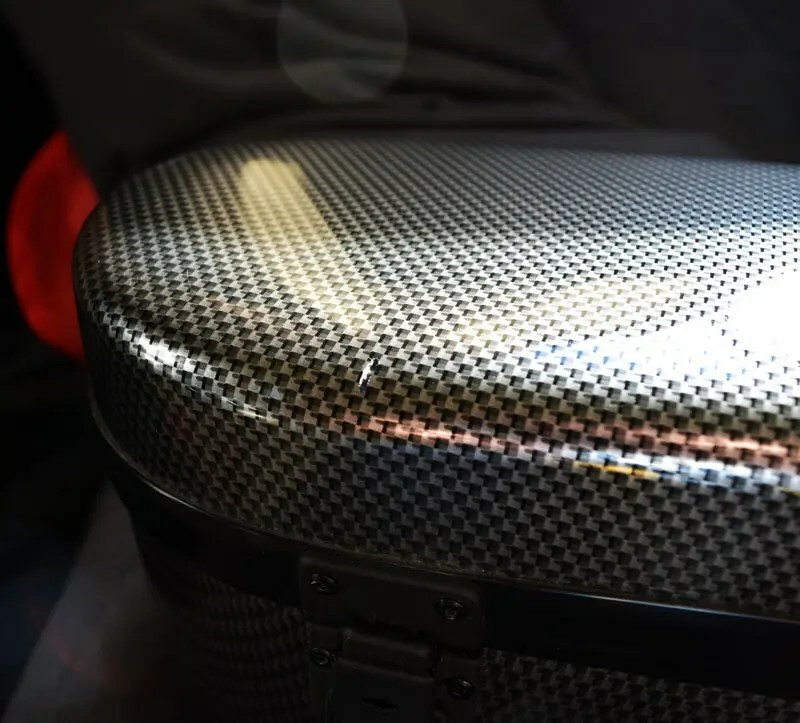 BAM are a french firm that specialize in cases, not just guitar cases and the main reason for investing in one of these cases would be for their lightness and ease of travel. That being said do not think about going short or long haul with these cases. They are not robust enough for planes, and like that proverbial super model above only travel in first class in their own seat. Read on to find out why. 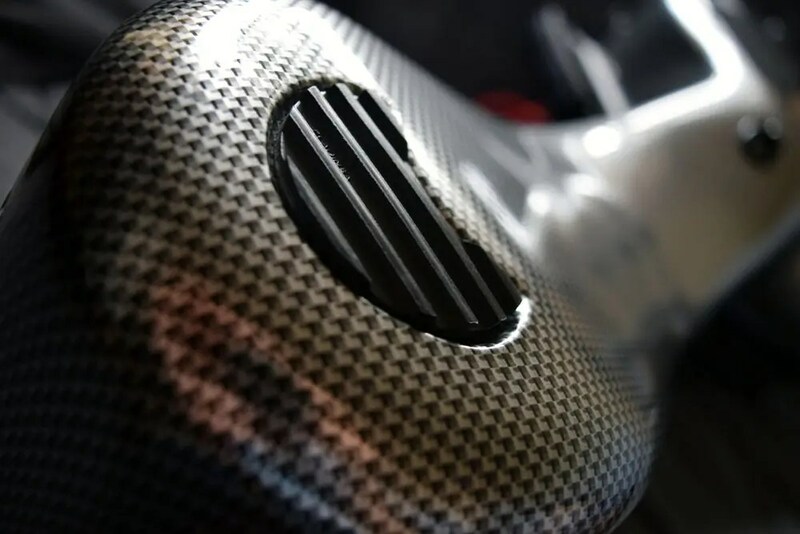 The shell is not carbon fibre, it is BAM’s own concoction which has been thermoformed into its sleek shape. The shell has a ABS/PVC foam lining, only if you are buying their Hightech line. and on the bottom side for laying it down. Which is great however the catches do get in the way and make it slightly unstable. Slight design flaw there. All the adornments on this case are well made and sturdy. 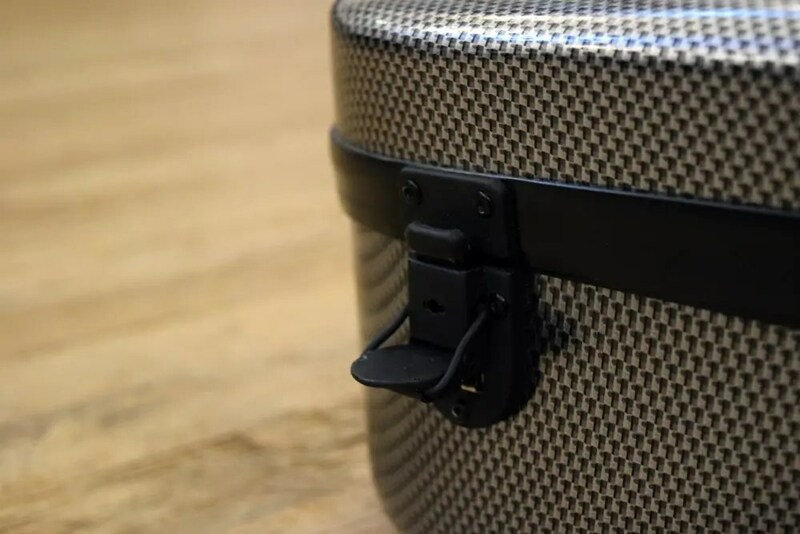 The catches on this case are excellent, encased in a sealed unit they lock the case effortlessly. 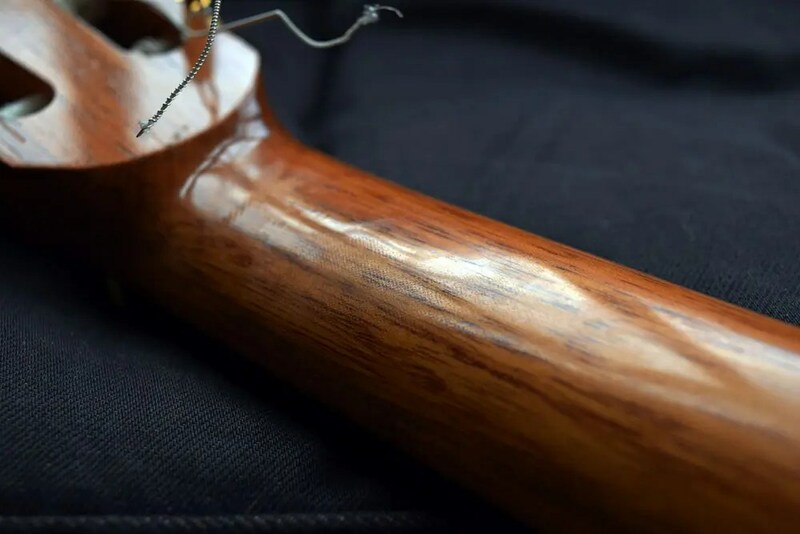 That all being said you will need to be careful putting your guitar back into the case as the catches do stick up a bit and it would be very easy to scrape the guitar bottom as it went in. 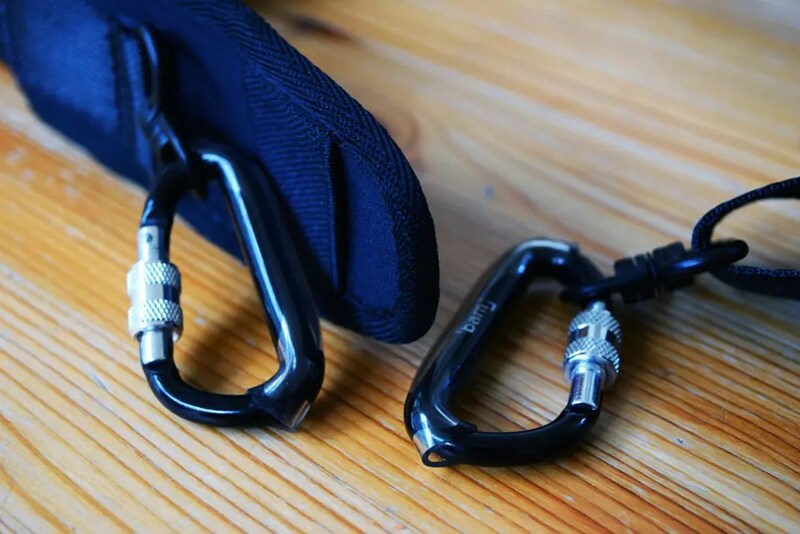 The handle is sturdy and will not break easily, covered in neoprene it is also very comfortable – unusual in a guitar case and highlights BAM’s attention to detail. The biggest selling point for these cases would be the seal on the case, it is a male/female variety and hermetically seals. So outside stays outside, or at least should do. 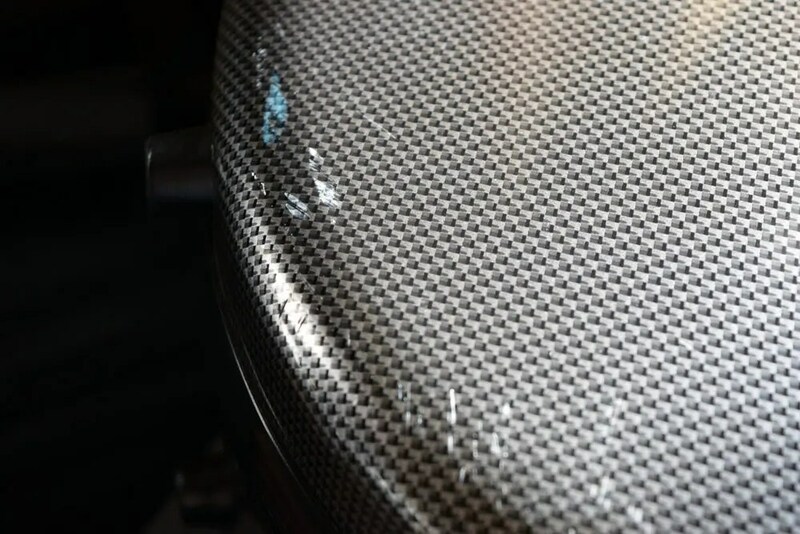 Be warned this case scratches easy, real easy, and they are not just surface marks either. Bang it and scrape it hard enough and the marks scar and go relatively deep. 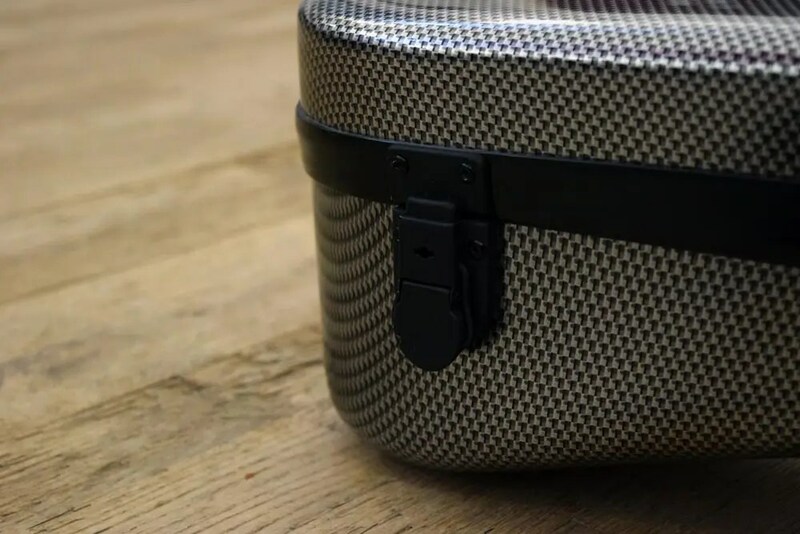 For a closer inspection, spec and BAM and all things guitar Français just head over to their site with this link: Tweed BAM guitar case. The fit is snug, to say the least, around the bout of the body with a lot of room heel to bottom. 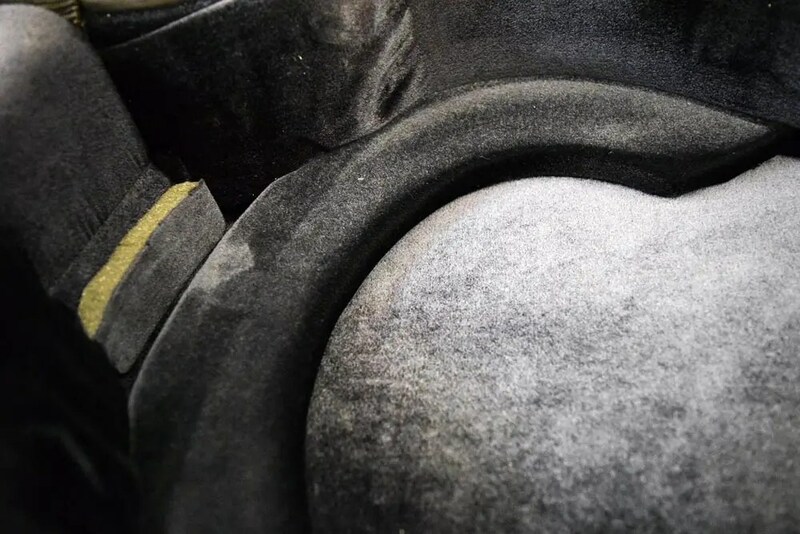 Hence it comes with a variety of little odd shaped foam buffers to help keep the guitar from moving around. 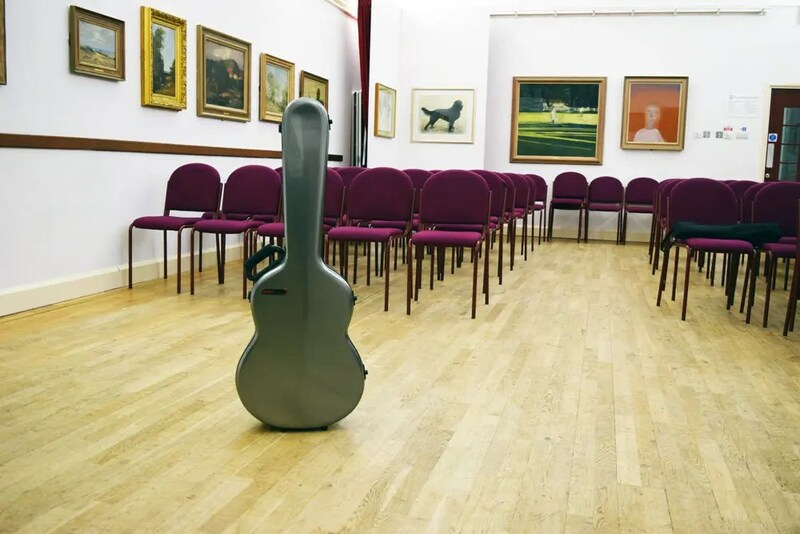 We had to use quite a few to get the Michael Gee concert guitar to stay put, so anything smaller would struggle to stay still. That being said one of the plus points, and according to BAM how to absorbs shocks, is that the guitar is suspended in the case on a series of built in buffers. So the case only ever touches the guitars body through these cushions. 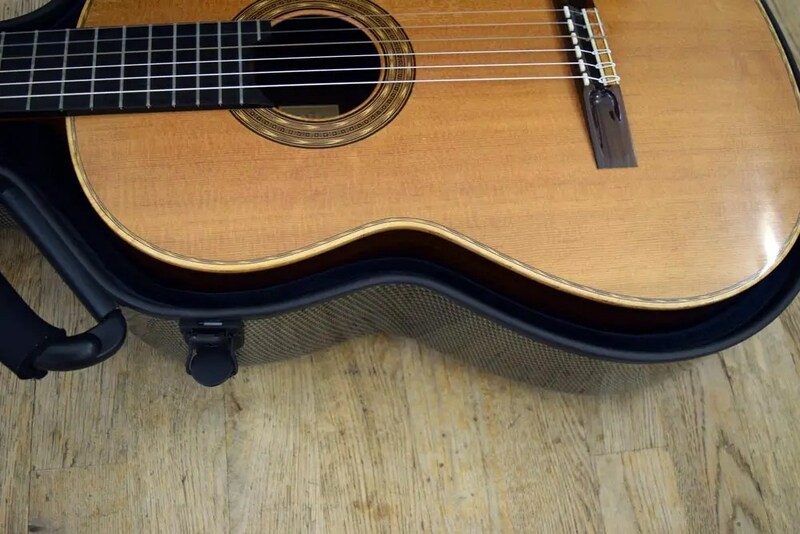 However that also means there is less cushioning between the guitar and the case body. 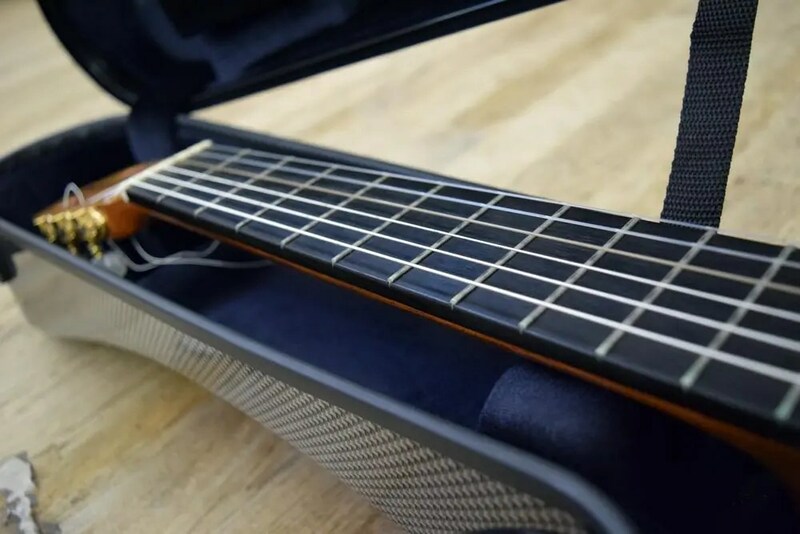 Due to it being such a slim case nothing heavy on top or it will bow into your precious concert guitar. 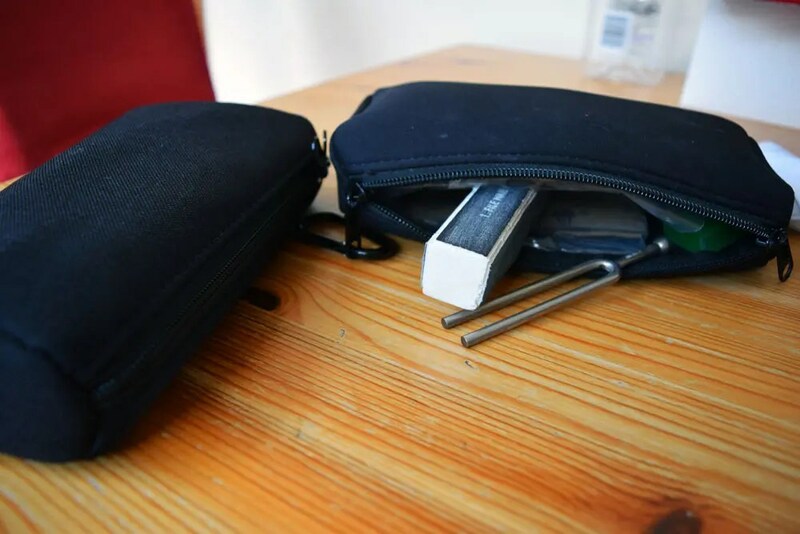 The case comes with two pencil case bags which have been designed to fit into the neck of the case under the guitar. However we found that only one case with “stuff” in fits in the cavity at a time and you need to be careful which way up the material is. 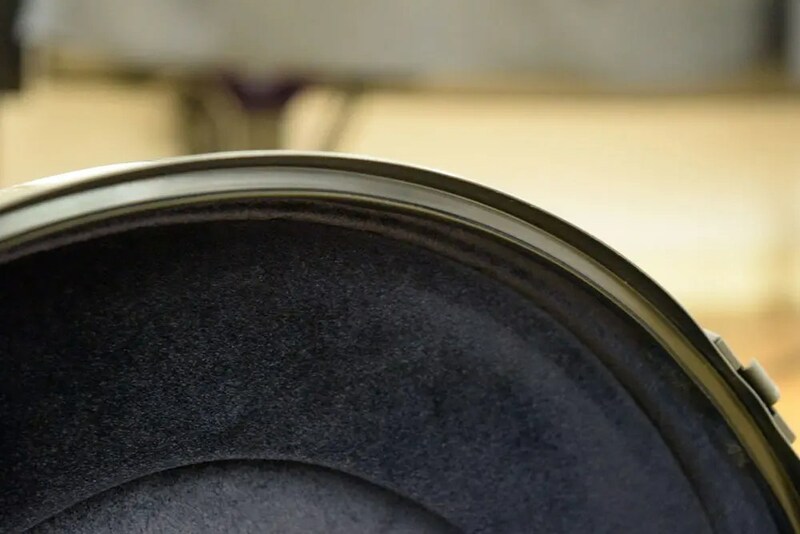 Wrong way up, as the case is a two tone design with neoprene one side, and the other side material (which is a lot rougher) will imprint on the neck, if you have French polishing and a little bit of a warm day. 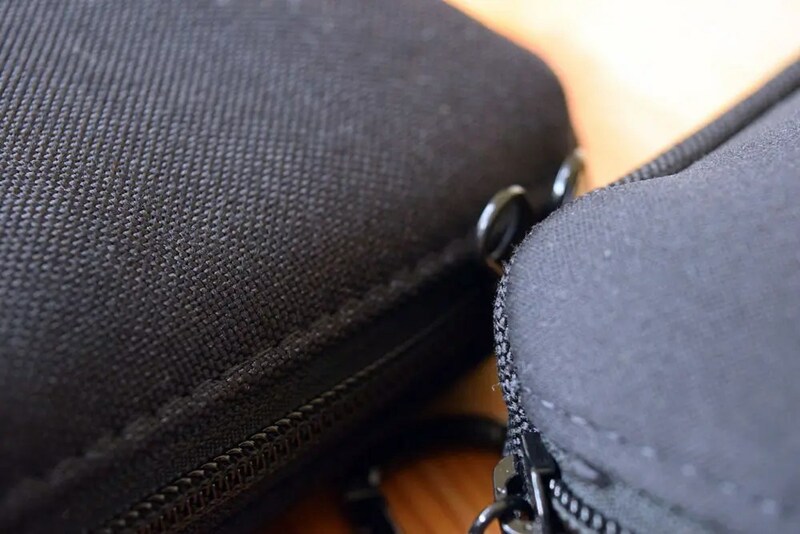 It also has two very sturdy straps for carrying, which easily fit into the pencil case thus making storage super. 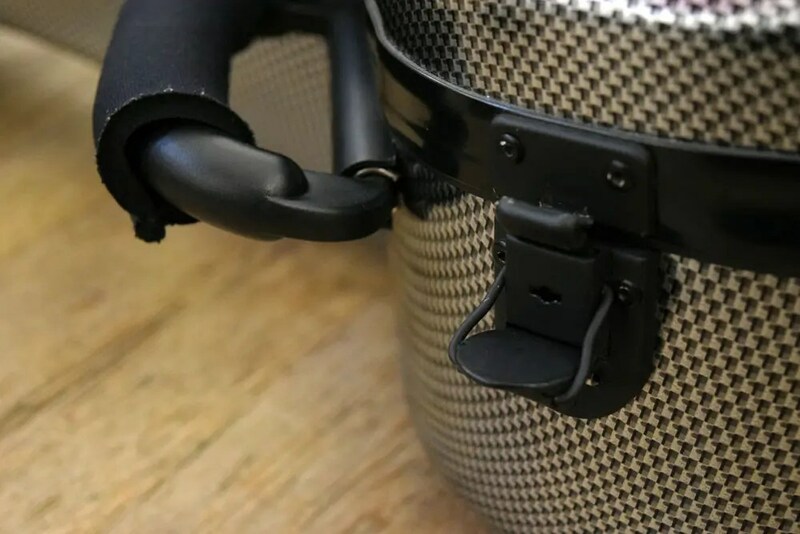 Again another reason for getting the case, the straps are not going to break straight out of the box on the first couple of outings. So far this review has tried its best to outline the best reasons for buying the case but with the extra provisos and Quid Pro Quos in plain sight. All of these were initially valid reasons we ourselves here at CGRocks used to justify the expense of the case. However through use and moving country we have found that this case is only really good for localized use. (And it does it well.) Being light and easy to carry it makes commutes in the urban environment a dream, almost like using one of those soft shell back pack style cases but with the security of a hard shell. However for any serious travel, gigging and or moving continents, it won’t work. 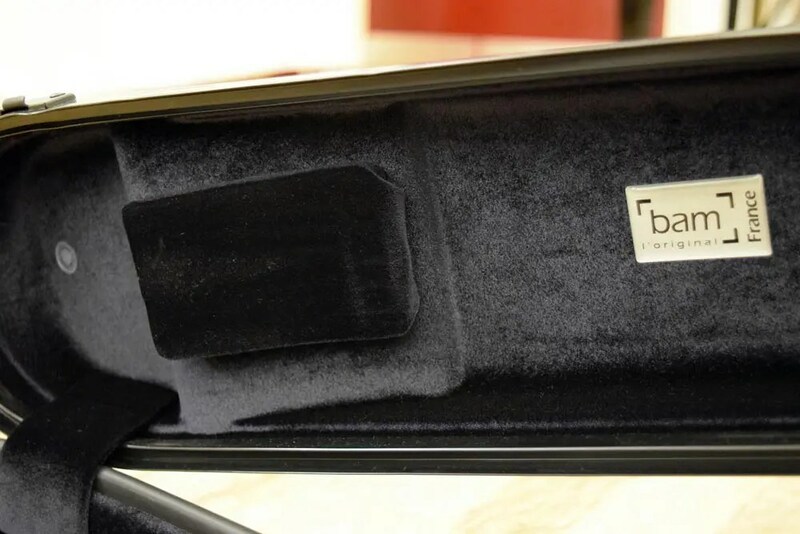 The case requires an outer case, the BAM Flight Case cover, for any sort of serious travel. This adds another couple of hundred pounds onto the price and pushes the case nearly into the £1000 mark. For the cheapest options on these cases in the UK head over to the Stafford Guitar.com. Check out all the damage below in this gallery. Bottom Line: do not use these case for long term storage and or international moving. This is an urban, travel to and from local gigs or college case, not a serious touring or moving case.